Ran 4 overnighters last week in 5 days and feeling the effects now as the night bite wasnt that great. The morning and evening bites though were off the hook. 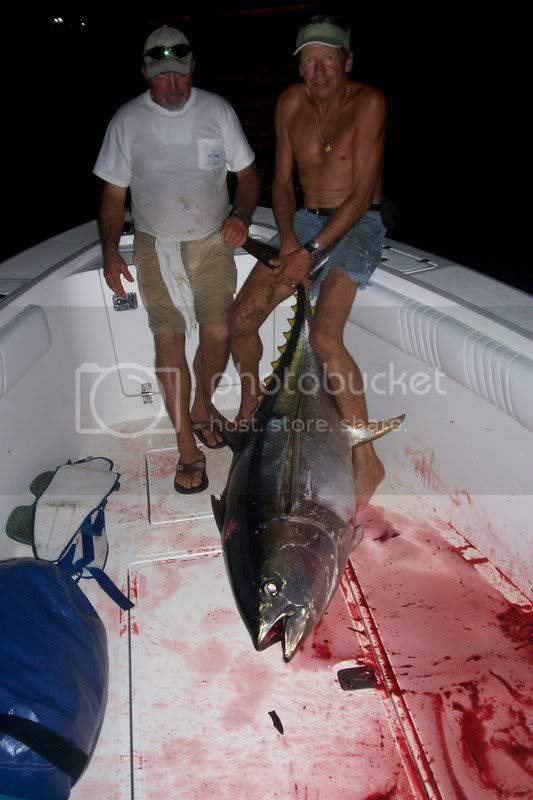 We did swordfish one night and hooked up to a solid fish only to lose it about 10 minutes into the fight. The first two nights I had David Lewis and his friends from Georgia on the boat. We sat out a storm at the first rig before we ventured out to fish. We ended up going one for two on chunks there and also got on a popper before we decided to head long. Went out to a rig about 60 miles out and just couldnt get the yf to bite caught one on a chunk there along with umpteenmillion blackfins on jigs. Around 330 we decided to head into the rig that had a decent evening bite and as soon as we got there at daybreak we were doubled up on a popper and a chunk. 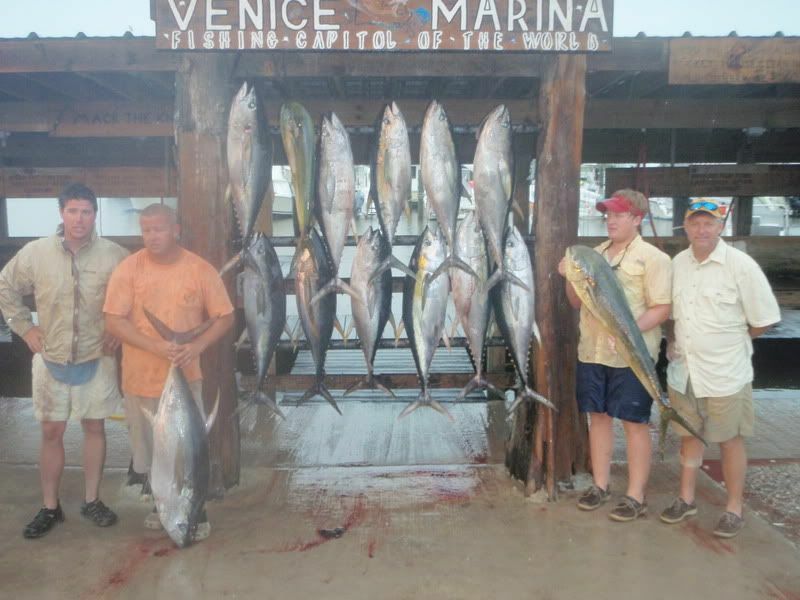 The popper fish went 82 pounds and the chunk one was about 40. We caught two more good yf and I said guys this is the final drift before we head back in. Sure enough we hooked a goodun on a chunk. The fish dumped about 200 yards of line straight down and just sat there for a little while before we slowly started working him back up. After about 45 minutes I stuck the gaff in a healthy 103 pound yf. 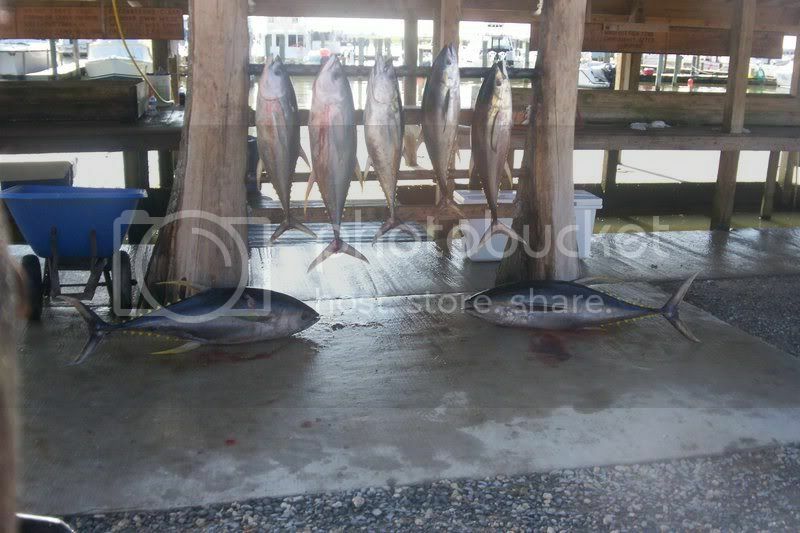 We made the hour and twenty minute run back to the dock then with our 8 yf and two dolphin. I had David again for night two so we headed straight to the rig where we got the big one and fished it hard. The afternoon bite was pretty good and we put three in the box to 90 pounds with one coming on a popper. 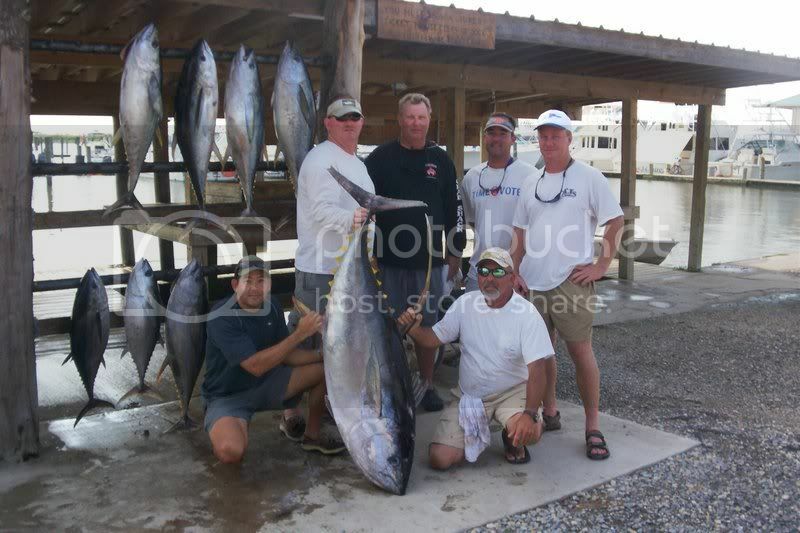 Since we had a slow night the night before we went swordfishing. Had one good shot at a fish on a live hardtail but we pulled the hook about 300 feet down. We headed back to the rig at daybreak and instantly started hooking up on yf. We doubled up twice and missed a couple more before we headed to the house with our 7 yf. 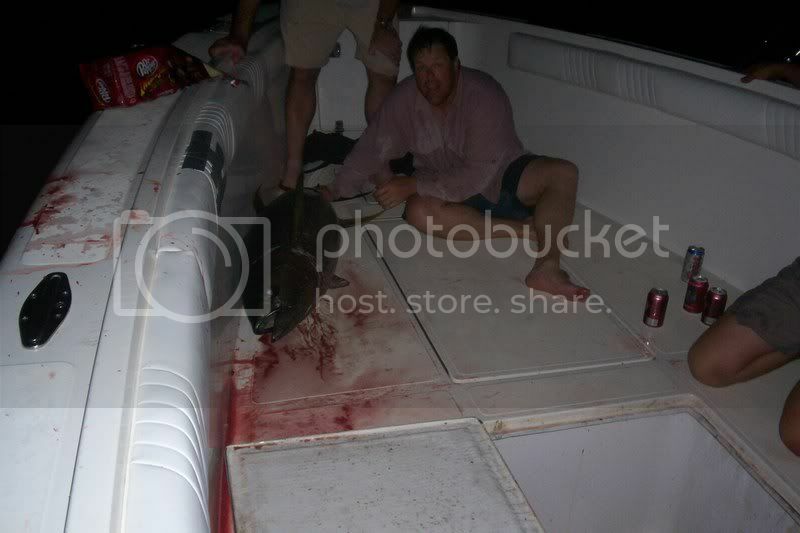 On night three I had John Edwards on the boat with his son and a couple employees. I went to our afternoon moneyspot and found 4 boats there already. We still caught one there before I left to make the long run to the southeast. Got out there and the fish bit hard from 745-945. In that time period we put nine yf from 35-45 pound and 6 magnum blackfins in the box. The bite there tapered off so we slowly headed in to the rig I wanted to be at for daylight to finish our limit off. Quickly caught the last two yf we needed and then ran through a good storm on the way in. Luckily we beat it in before it got too bad. On sat night I had Darren Haggard and his friends from Fl on the boat. My plan was disrupted by the fact that we ran into dirty water at my inshore spot on the way out. We tried it anyways with no luck before we headed to the east. Once we got there it looked like a deadzone until about 615 when the yf started coming off. The first time we had saw them we had a triple hookup with two on poppers and one on a chunk. Landed two of those three and lost the third after about an hour on a popper. Ran back over to the spot and got another one on a chunk. Then Mike hooked up with the big boy on a chunk and it about dumped his tyrnos 30 straight down. Luckily it stopped about 900 feet down. 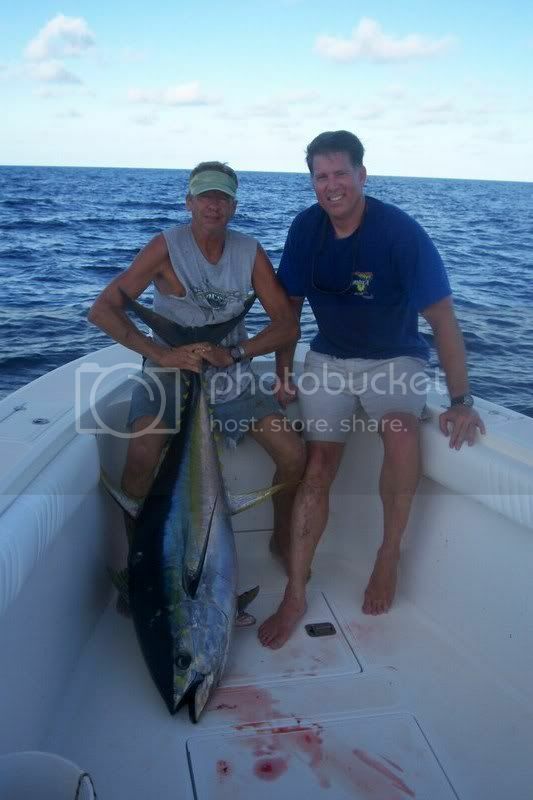 While we were fighting this one we hooked three more and landed two of the 40 pound yfs. the big boy was mean though and we fought him for about an hour and 45 minutes before I was able to stick the gaff in the fish about 1015. By this time the rigs bite was over unfortunatly. Got the fish on ice in the box barely and it was definitly one of the fatter yfs I have caught. It was just a short stubby 157 pounder. 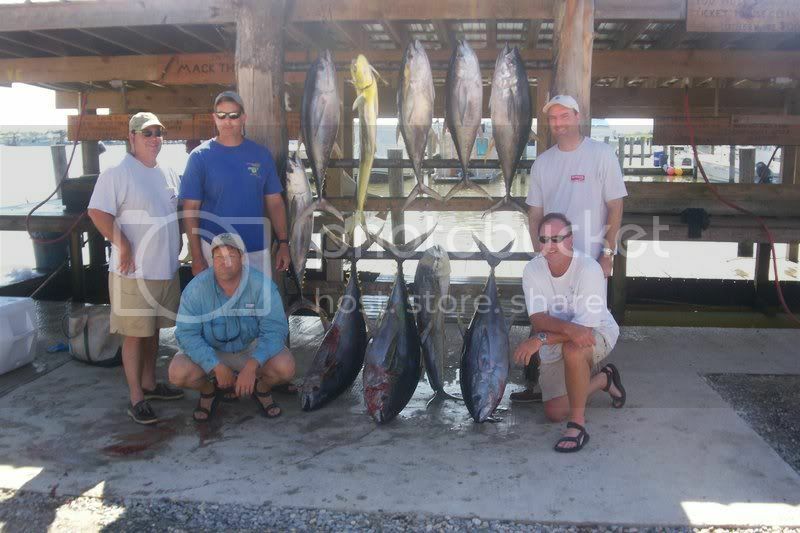 We fished hard the rest of the night for two good blacks before we headed to the dock with 6 yf anchored by the big one.